The Chinese military is currently undergoing a major renovation with the development and introduction of new weapon systems such as the Type 094 SSBN and the J-10 fighter aircraft. Part of this major facelift, aimed at making the Chinese military a more streamlined, modern, and capable force, is directed at the ground-based air defense network. Until advanced Russian-made S-300P family SAM systems were introduced in the 1990s, the primary strategic SAM system was the aging HQ-2 (CSA-1 GUIDELINE), a copy of the technologically ancient Soviet-era S-75 (SA-2 GUIDELINE). The introduction of the S-300P has provided China with a modern, robust SAM system capable of dealing with 21st century airborne threat systems, but the desire to produce a native system was still present. That system was the HQ-9. The HQ-9 is a modern mobile strategic SAM system roughly analogous to the Russian-made S-300PMU (SA-10B GRUMBLE). The HQ-9 has a range of 100 kilometers, an increase over the S-300PMU's 90 kilometer maximum range but less than that of the S-300PMU-1's 150 kilometers. The containerized missiles are carried in groups of four on the back of wheeled TELs very similar in design to that of the S-300P's 5P85. Target prosecution is handled by the HT-233 phased-array radar system, mounted on a wheeled chassis in a configuration very similar to that employed by the S-300PMU, which mounts the 30N6 (FLAP LID) engagement radar on a MAZ-7910 chassis. The HT-233 radar is likely capable of engaging multiple targets thanks to its phased-array construction. The similarities between the S-300PMU components and the HQ-9 components may be the result of a limited reverse-engineering effort. China had no prior experience in developing a modern, high-performance strategic SAM system, and it is likely that the S-300P was examined as either a possible starting point or at the very least a general roadmap for component design. Espionage efforts may have aided the development effort as well, as the HT-233's radar array bears some similarities to the MIM-104 PATRIOT's AN/MPQ-53 phased-array radar. Were the HQ-9 to be an amalgamation of S-300PMU and PATRIOT technology, it would have to be regarded as a very formidable weapon system, although there is no reason to doubt the system's effectiveness were this not to be the case. Trials of the HQ-9 were conducted at the Shuangchengzi SAM test range located in north-central China. HQ-9 production appears to take place at a facility located southwest of Beijing at 39 47' 22.62" N 116 09' 28.40" E. What would appear to be a complete HQ-9 battery is located on a pad at this facility, probably undergoing system checkout and calibration before the battery is deployed to an operational site. HT-233 radar development may have also taken place at the Beijing facility. The facility appears to house an RCS range. 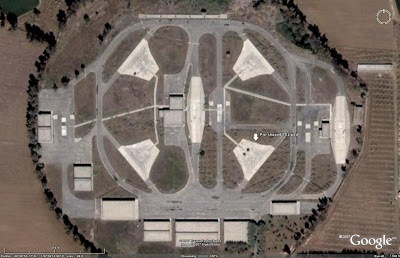 The presence of an RCS range and HT-233 radar vehicles indicates that this facility may be used for radar development as well as HQ-9 production. A typical HQ-9 site will consist of a raised central berm for the HT-233 engagement radar, surrounded by four prepared pads upon which the TELs will be deployed. 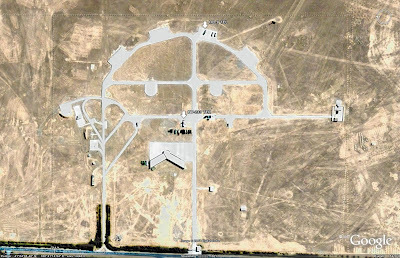 A pad is located next to the HT-233 berm, likely housing generators or command and control facilities. 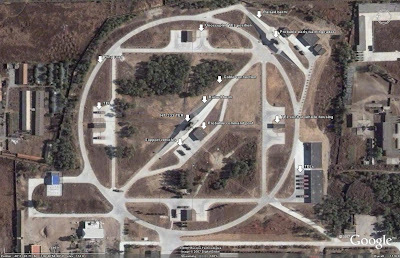 A circular path surrounds the main complex, containing the TEL pads and the engagement radar position. A second raised berm is situated outside this circular path, likely intended to mount an early warning radar of some sort. The one inconsistency in identified active HQ-9 sites is the presence or lack of additional structures housing various pieces of support equipment. This includes a vehicle situated between the TELs, which probably serves as a control vehicle for two TELs in much the same way that the "Master" 5P85S TEL is used to control 5P85D "Slave" TELs in an S-300P battery. System components of an HQ-9 battery are linked via cable connections. Identifying HQ-9 sites in imagery can be a confusing task. The system components share similarities with those of the S-300P family, and the site layout is very similar to that of the S-300P systems based in China and other nations across the globe. 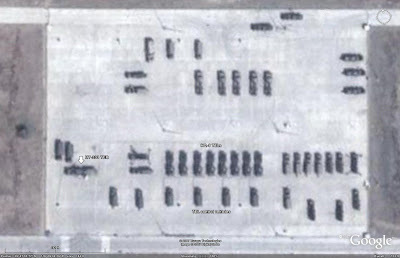 In order to avoid misidentification of a given site, it is important to be mindful of the identifiable differences in the layouts of HQ-9 and S-300P sites. The first obvious difference is the presence of the control vehicle between the HQ-9 TELs. This feature is absent in an S-300P battery. It is not important, however, to go to this level of detail to differentiate between HQ-9 and S-300P facilities. 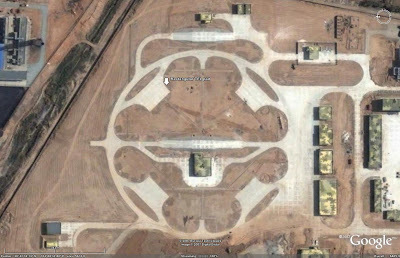 The second identifiable difference between an S-300P and an HQ-9 site is the shape of the TEL pads. 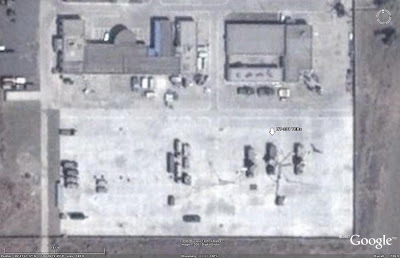 The following two images depict unoccupied HQ-9 and S-300P sites located in China. Note the rectangular shaped pads provided for the HQ-9 TELs, compared to the pie-shaped pads provided for the S-300P TELs. Given proper attention to detail and a working knowledge of the characteristics of each SAM site, it can be seen that it is possible to differentiate between HQ-9 and S-300P facilities without having to discern differences between individual system components. Furthermore, it has been demonstrated that it is possible to effectively identify unoccupied facilities with a high degree of precision. 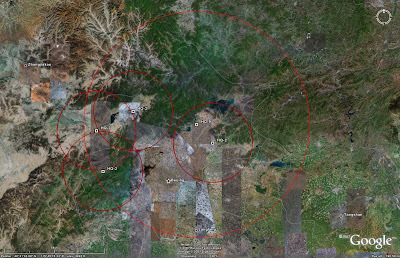 The HQ-9's 100 kilometer range and multiple target engagement capability means that fewer SAM sites are now required to defend a given portion of airspace. The following image depicts the coverage provided by an HQ-9 site situated north of Beijing. Note the much smaller coverage areas provided by the four HQ-2 sites in the same region. China's first entry into the seaborne nuclear deterrent realm was the Type 092 Xia-class SSBN, a solitary vessel plagued by problems and a short range SLBM. 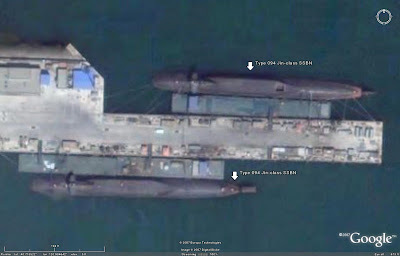 For the first time, imagery analysis has discovered the presence of multiple hulls of a new class of SSBN, the Type 094 Jin-class. This evidence signifies the new commitment to a seagoing nuclear deterrent force by China, changing the nuclear warfighting dynamic in that region of the world. Produced as a solitary example, the Type 092's primary drawback as a strategic deterrent was the lack of an adequate SLBM. The JL-1, China's first SLBM and the weapon employed on the sole operational example of Type 092, the Xia, suffered from a lack of intercontinental range. The JL-1 had a range of 2500 km. If the Xia operated close to the Chinese mainland in waters that could be secured by other PLAN assets, then the deterernt value of the Type 092/JL-1 combination would be severely limited, making it only truly effective in a regional conflict. The short range of the JL-1 meant that the Xia would have to operate much closer to the United States in order to mount an effective deterrent patrol outside the Far East theater of operations. Given the limited number of land-based ICBMs available to the Chinese military at the time, it is possible that in the event of serious hostilities the Xia would be intended to operate in just such a fashion. 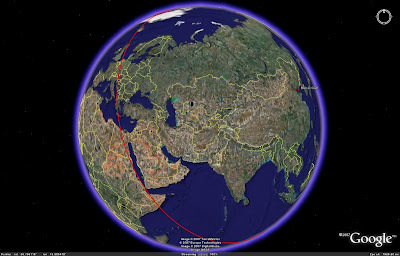 The above image demonstrates the close proximity that the Xia would have to come to the United States in order to launch any serious strike against military targets. The 500 kT warhead of the JL-1 precludes its ability for being used in a strike against major population centers; this role is better suited to the DF-5 ICBM. The JL-1, therefore, is most likely suited for a counterforce strike, or a preemptive strike against strategic assets, a role which would be enhanced due to the limited reaction time thanks to the close proximity of the launching SSBN. The main problem, however, is the aforementioned proximity. The Xia must penetrate American waters and evade detection and attack by interloping 688-class SSNs. Such a dangerous proposition would likely preclude the use of the solitary Xia against the mainland United States. It is most likely, therefore, that the JL-1/092 combination was intended to provide a deterrent against Japan and South Korea, as well as US military forces in the region, as both nations are well within the range of the JL-1. Another possibility is the forward deployment of the Xia to strike against the Pacific Fleet headquarters at Pearl Harbor in Hawaii, but this again places the Xia at a higher risk as it would operate further from protected Chinese waters. The answer to China's seagoing deterrent capability is the new Type 094, or Jin-class SSBN. The Type 094 SSBNs will be armed with the new 8000 km range JL-2 SLBM, which is currently undergoing testing. The advantage of the JL-2 is that the longer range allows for a much wider range of deployment options. The most interesting concept would be to position the Jin-class SSBN fleet in the Bohai Gulf, in close proximity to the Type 094's homeport of Xiaopingdao. This would keep the SSBN fleet very well protected from attack, and allow for a significant seagoing deterrent capability. A Bohai-based Jin would be able to range as far West as Europe and the Middle East. 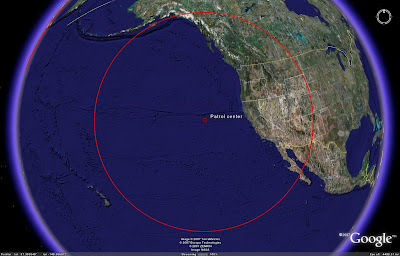 Where the Xia had to close within 1000 kilometers of the American coastline to strike targets deep inside the United States, the Jin could remain 3500 kilometers offshore and range the entire nation, from West coast to Eastern seaboard. A patrolling SSBN in the north Pacific is much harder to localize and engage than an SSBN which has continuously proceeded towards the American coastline, allowing for far more opportunities for detection and tracking, especially given the passing of Hawaii and associated antisubmarine warfare systems. While the PLAN was satisfied for a time with the solitary Xia SSBN, probably due to operational problems which have plagued the vessel, a whole fleet of Type 094 SSBNs is planned. For the first time, China will have a sustainable seagoing nuclear deterrent force. 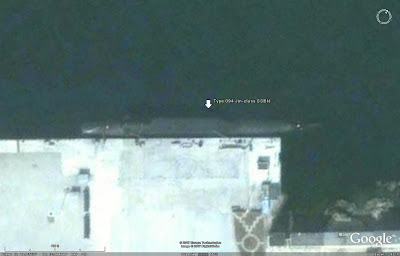 While the lead Type 094 SSBN has been seen in photographs for some time now, the first evidence of a large-scale production program has recently been uncovered in satellite imagery. Further analysis of the available imagery would seem to suggest that there are in fact now three distinct examples of Jin-class SSBNs in existance. The two submarines at Huludao are riding higher in the water than the example at Xiaopingdao, suggesting that they are newer hulls still in the process of being fitted out, while the Xiaopingdao hull is in a near-operational state as evidenced by its greater gross weight denoted by the fact that it is riding lower in the water. 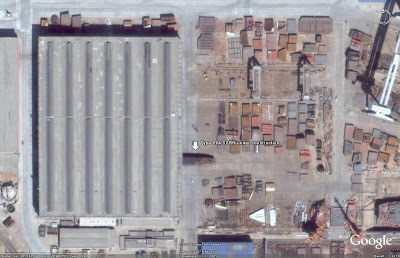 The presence of various items pierside of the two Huludao hulls would suggest that this specific pier is designated for the fitting out of newly-produced submarines, an interesting fact to note for further analysis in the future when newer imagery of the area becomes available. Further analysis of the Huludao shipyard appears to depict a third Type 094 hull in the area. What appears to be the rear end of a submarine hull can be seen jutting out of one of the main assembly halls. This object has a diameter of 11.8 meters, which would match up well with the 11.28 meter measurement taken from the visible hull of one of the two pierside 094s in the shipyard. A submarine out of water would obviously have a greater visible diameter as part of the hull is obscured from view under water when the vessel is seaborne. By employing Google Earth's overlay feature and adjusting the image opacity, it can also be seen that the hull contours of the unfinished hull match up nearly perfectly with the rear of the two 094 hulls pierside at Huludao. This hull would represent the fourth Type 094 SSBN, provided that the earlier analysis of the presence of three distinct hulls is accurate. The presence of multiple new SSBNs in China will enable the Chinese military to develop new nuclear deterrence postures and tactics, changing the warfighting dynamic in the region. Where the Xia only represented a minimal threat, a fleet of Type 094 SSBNs will enable China to rely more and more on the seaborne nuclear deterrent, a far more dangerous warfighting tool than land-based weapons thanks to their significantly greater elusiveness and therefore survivability. 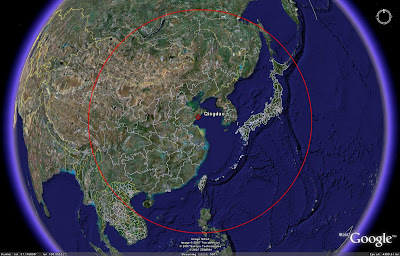 -SLBM ranges used to construct the range rings were taken from the website Sinodefence.com.